The Innovations Black and White Chess Slate Laminate Flooring features the beautiful appearance of genuine slate with its inter plank design and embossed-register texture that also improves slip resistance. This floor includes a 2 mm noise-reducing foam underlayment that helps expedite installation along with micro-bevel edges and a floating-click design. 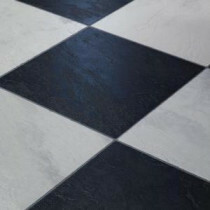 Buy online Innovations Black and White Chess Slate Laminate Flooring - 5 in. x 7 in. Take Home Sample IN-683363, leave review and share Your friends.